Once upon a time I was young and considered my stomach invincible. I was also jobless and living in Mexico City, being "smart" by eating as cheaply as I possibly could. I was getting ready to sidle up to a taco cart in some forgotten corner of the city that was advertising tacos for the equivalent of about 10 US cents. I was peering over some bystanders at the grill, trying to figure out exactly what kind of meat was being served, when a wise, wrinkled (and slightly crazy) old man came out of nowhere, grabbed my arm, and basically yelled at me: "Save money now!" And he gestured wildly to the tacos: "But pay later." He winked and seemed to disappear into the crowd. Despite this ominous encounter, I still thought about eating there for a minute as a full meal for well under a dollar is not easy to come by. I stopped for long enough to look the taquero up and down and noticed his grimy hands and the greenish, unidentifiable raw meat festering below his grill. I decided to pass. The life lesson, of course, is not that cheap food comes at a price, but that the world needs more crazy old men roaming the streets (and I for one, am well on my way to becoming one). But apart from this near miss (and a couple dozen questionable decisions in the years following that led to actual sickness) for the most part cheap street food the world round is amazing. In Denver (and most other US cities), however, you have to go out of your way to get cheap street food, what with all these fancy-Dan food-mobiles abound. And if you want to sit down with a roof over your head? A truly good and cheap meal can be harder to find than it ought to be. 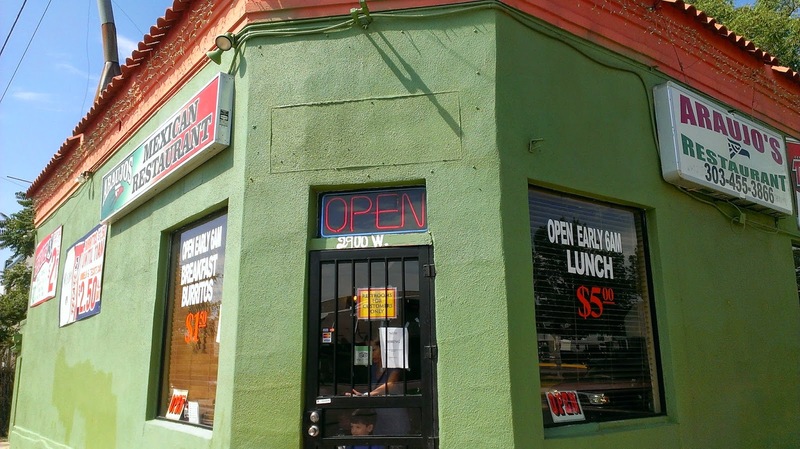 Then there are places like Araujo's, just East of Federal on 26th, where one can still get a burrito for $1.50. While that is much, much more than a 10-cent taco, it's still pretty damn cheap. And for a man like me, hard to resist. So late this summer my family and I headed over for a weekend breakfast meal to see what it was all about. Instead of ordering burritos to go, we were tempted by the rest of the Araujo's menu. 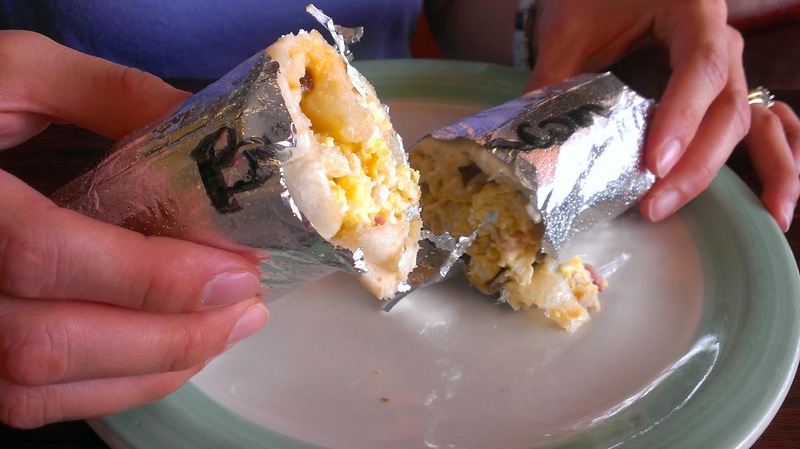 We soon learned, however, that eating a sit-down meal during the Sunday morning burrito rush at Araujo's is not for the impatient. Whatever urgency we saw (and urgency is not a good word to describe anything that we saw that morning) was being directed towards getting burritos ready for the large take-out orders that seemed to roll in endlessly. To more than make up for it, though, was the coffee. 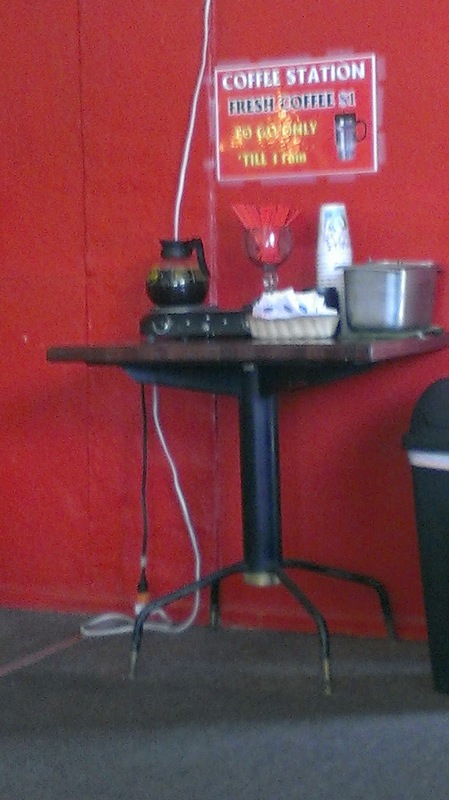 The so-called Araujo's "Coffee Station" consisted of an old drip pot on a warming plate on a wobbly table. It looked like it would surely be an acrid, weak office-style brew. The kind that you can only force down because you are in desperate need of caffeine or because you hate your job and yourself. Instead it was a lovely, balanced cafe de olla: strong, but with hints of clove and cinnamon. 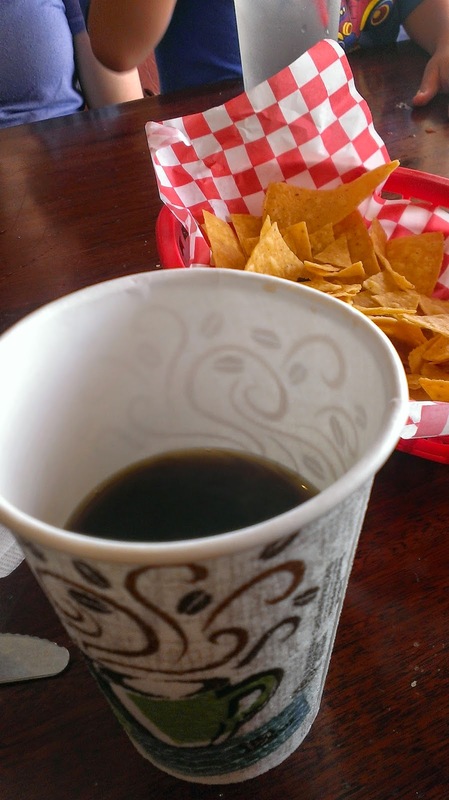 I had several cups and actually savored our long wait for the food because it meant I had more time to sip. 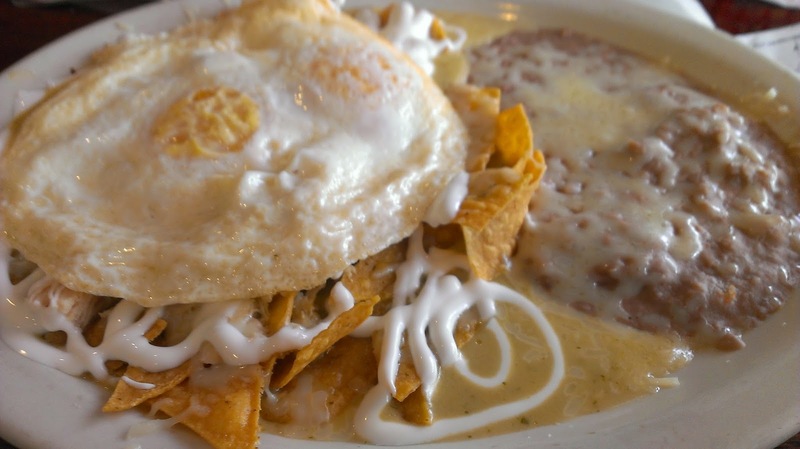 Despite the excellent coffee that went surprisingly well with the loads of tortilla chips that kept appearing in front of us, I was more than ready to dive into my enormous plate of chilaquiles when they arrived. The only thing that kept these chilaquiles from being great in my mind was that the tortilla chips were too thin (the same that were served in the baskets pre-meal). I prefer a thicker totopo that gets a good soaking in chile. However, to compensate for this, Araujo's pours the salsa on just before serving, so their thin chips don't completely wither away. The green salsa, luckily, was excellent, and the eggs ran gooey all over. Melted cheese, creamy beans and swirls of crema fresca abounded. I absolutely licked my plate. My wife went non-breakfast. A questionable move at 9am, and I think the cause of much of our delay. However, the result was a plate of perfectly fried flautas topped with fresh guacamole and copious amounts of crema fresca. 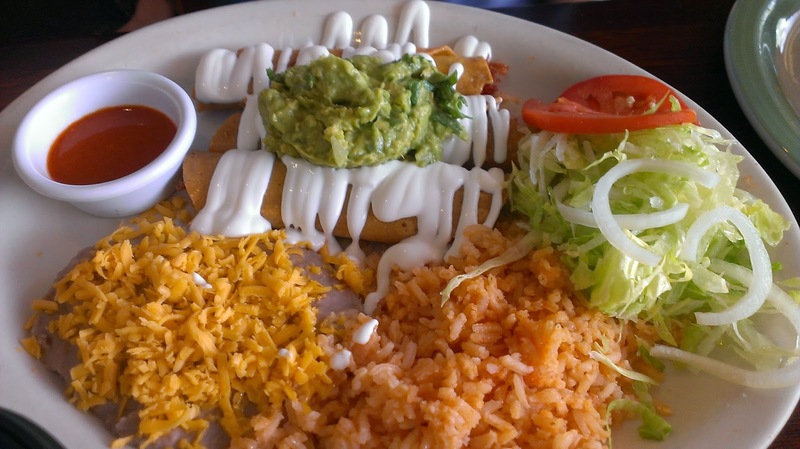 Nothing fancy or too hard to execute, but flautas done right are one of the world's perfect foods. Oh, and we couldn't leave without some burritos. My kids ordered one each, and although they do handle their spice well for 3-year-olds, they opted out of the green chile--even the mild. It was therefore hard to fully judge these 150 cent wonders, but with a good dose of green chile I imagine they would be wholly satisfying. Araujo's is, appropriately, renowned for its cheap burrito eats, but there is a lot more going on in that tiny kitchen. I can't say enough good about Araujo's from our single visit there. Every Denver neighborhood needs a place like Araujo's.